Sometime earlier this year, I read someone's posting about finding great deals on rug hooking supplies on the Goodwill website. I had no idea they had a website, so I had to investigate. Within 48 hours I was bidding madly and purchased an old Singer sewing machine, and for weeks afterward I found myself stalking (I mean, watching) lots of other sewing machine auctions. 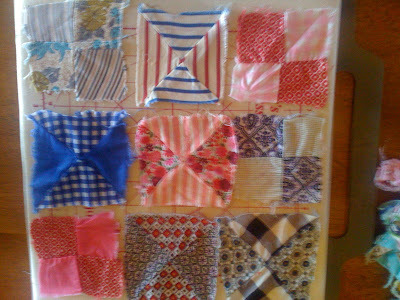 In between sewing machines, I found a sale for some hand sewn quilting blocks. I purchased them for more money than I probably should have, and after two attempts and double postage cost, they finally arrived. I washed them and this week, finally finished ironing them. They are all sorts of little odd shapes. I wonder whose work it is. Was it a child, perhaps, or someone's grandmother, sitting in her chair, waiting out the remainder of her years? I love them. I am not sure, at this time, what I will do with them, but hope to honor the maker by seeing them to the finish line. Have I mentioned how I worry my things will end up in a thrift store one day? Sigh. 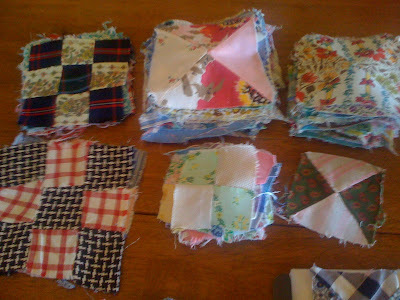 I know you'd love the quilts my younger sister makes; they're all hand sewn (if you can believe that - she can't sit at the sewing machine for very long and so has to put them together while propped up on the couch). She has such a great color style...unlike me who just likes "bright". How terrific that you're finishing up a quilt for a total stranger! Oh no, now I know about the website too.